Benny Ong: Back From Bangkok! I just arrived home from KLIA LCCT about two hours ago. The Air Asia flight was delayed about two hours which was tiring. I will reposting the activities for the past week as I had no chance to log on during my week's holiday in Thailand. Here is the last picture I took from Suvarnabhumi Airport. 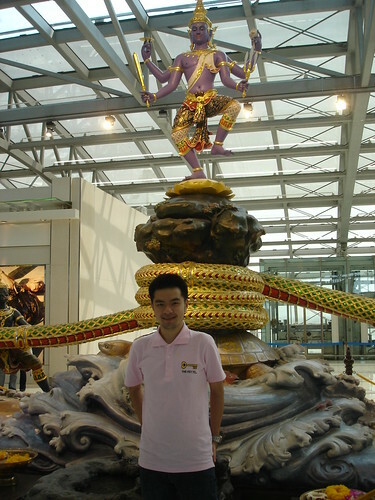 It is a life size sculpture of one of the many Thai legends which never fail to amaze me. I couldn't be bothered to shave for the last three days in Thailand as the picture shows. This is because I am just tired and can't wait to head back home. I am glad to be back in KL and will be sharing a couple more posts throughout my time home before I return for Southampton.